One of the most common advice that was dished out to folks having money problems is to have a budget. For me, I felt that you do not always need a budget if you get competent with money, but if you aren’t, you got to understand about the budget to sort yourself out. Going through the motion of creating and maintaining a budget trains the money discipline that have been missing in your life. The best form of budgeting is not some form of super sophisticated smartphone app that do everything for you. No. It is the kind of budgeting that you have to do majority of the work yourself. Just like studying, writing down things create some reactions that make remembering and understanding better. 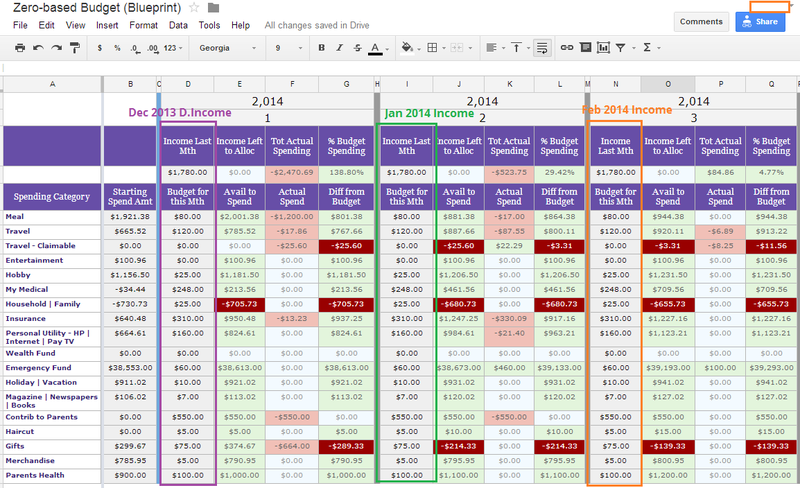 Using a Spreadsheet and carrying out Zero Based Budgeting is what I recommend for most people. If you are going through the budgeting experience, you probably sometimes beating yourself, self depreciating that you shouldn’t have bought so much on this, you can’t help but to spend on that TaoBao buying spree that you have not used for a year. By compartmentalizing money the way you do in Zero-based budgeting, you can also isolate your mistakes. A simplified way to compartmentalizing your money can be splitting what you take home into two amounts: Your Wealth and your Expenses. There is a reason we label them that way, because you want to be wealthy and the way to be wealthy is to cut your expenses to an optimum level. Have a third compartment, and that is the expenses that you spend that you conclude at the end or start of the month during budgeting that it is a mistake. So suppose you add them up and they come up to -$420. If you keep making more mistakes, this amount will balloon to -$1000 and even more eventually. Compartmentalizing this way tries to make you face up to the music, that you STILL have a control problem there and that is why the amount is ballooning. If this amount is negative, it means you owe someone for spending it first. This person can be a credit card company, the sensible self or your future self. 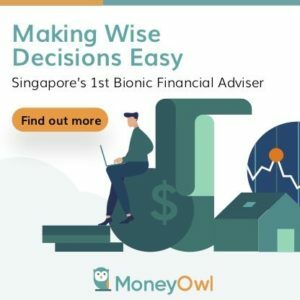 When you get a windfall, say during bonus time, or an SG50 bonus, or 4D windfall, you know that you cannot enjoy that windfall and have to pay down your mistakes. If this works, overtime, you will have less mistakes. You have less mistakes because you will think whether you need that thing, whether it fits your value system, else you don’t buy. The Mistakes Jar is one indicator of your budgeting performance. I don’t have a mistake jar, but there are many jars that tell me I am not doing things well such as why my medical account is always negative. I need to do better there. In many cases, the motivations to improve aren’t very big. Things have not gotten out of hand unless the person is deep into debt. Hence we have budgeting which is the end result of 2 and 4. It will only work if you build into the system of an external auditor or mentor, to ensure to call you out that you are not improving. How about you? What are your budgeting problems most of the time? What threw you off the budgeting train? Tracking your spending in an App is useless unless…. I have a friend whom I consider an outlier in that she started early tracking what she spend her money on. She has an excel workbook where she inputs her daily or monthly spending to a rather granular detail. This is hard to do, unless you are a data nutcase like me. Ask 10 person and likely 8 of them will tell you, They can spend their time doing something much better. The problem for her is that, despite this, she share that she have a problem controlling her spending. The problem here is that, while tracking where you are spending your money is good, that is just Data Collection. Fancy apps do not magically make your financial situations better. Apps are the enabling devices, or the support tools. What is equally important is that, you need to review and reflect upon your data, there after create some processes, systems or habits to change how you live your life currently. In You Need a Budget (or YNAB), they advice not to over categorize your budget. Bring out a certain targeted area where you are having problems. Suppose you have a problem with clothes. You buy a lot of them (or are you buying a lot at all?). You break this spending out in a category call Clothes to collect the Data. Cut your Clothes money allocation by 10% for the next month. Slowly ease it down instead of setting an unattainable target of 50% since you were having a problem with it in the first place. Then cut another 10% the following month. A meaningful change here affects the Reality, and further collection of Data will show whether it is working or not. If it doesn’t work that well tweak the Change. 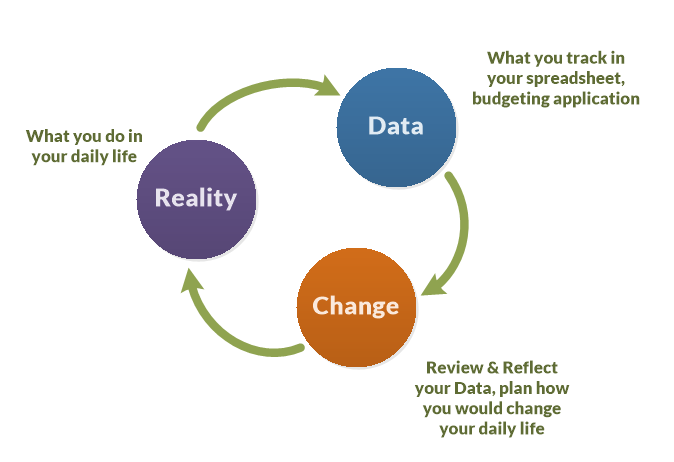 This is how Reality, Data and Change come together to improve your financial situation. And while we are on this topic, you will notice that collecting Data through spreadsheets, paper or a mobile app is important as well. If you do not have Data, how do you know what to change and how much to change? These three items in the diagram are equally important. Don’t blindly collect the data and do nothing with it. Bully the Bear talks about finally being able to see a non-negative number for his March budgeting. I thought that is an interesting share. 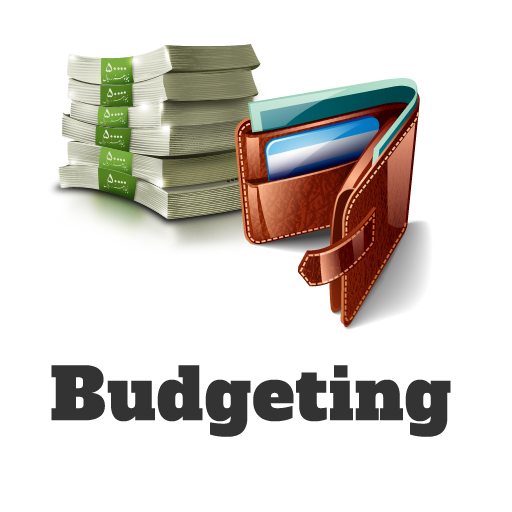 This rule comes from the famous budgeting software called You Need a Budget. Not many said a bad word about it. I find that it lets a person be responsible of every dollar he owns. If no one explains budgeting to you, the first thought would be to budget what you earn this month. We some how find that it’s a bit like putting the cart in front of the horse. Well, not always, its rather like in project management where you forecast each item in the future how much it cost per unit and get the budget for it. YNAB’s take is to spend last month income this month. 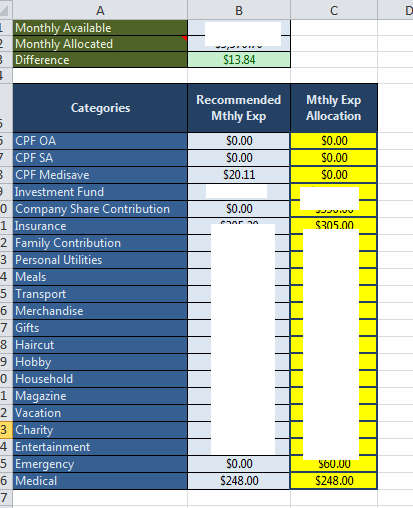 I know you guys probably don’t have something to do envelope budgeting, so you might want to try out this spreadsheet which I am monkeying around with. It does envelope budgeting like how YNAB does (since it’s a spreadsheet and not a full fledged app, there are limitations). Just go to File > Make a Copy to start monkeying around with it. As I do this more (for the past 9 years) I tend to be accustom to spending last month’s income rather than plan forward. It makes sense that those are the tangible money I can allocate, versus not knowing about the future and depending on that. I believe this makes more of a difference if you are self-employed or have variable income. In this example, planning for Jan 2014 budget means using Dec 2013’s income. If you are planning on a fresh, you might want to save up for at least one past month’s cash in order to execute this. You then proceed to spend what is “Avail to Spend”. This Sunday, Jonathon continues writing about ways that you can live frugally after telling us that we can save $100k by age 30. This is just one aspect of an austerity drive where I try to rein in my daily spending to that daunting $35, which is in the ballpark of the $32 daily budget that I arrived at in the Young & Savvy column two weeks ago. I calculated that this figure would allow a person starting work at 25 years of age to hit $100,000 in savings and investments by the time he was 30. But it has been an uphill struggle – reflecting reader comments after the article that it would be tough to live on such a budget. I really like what Jonathon is doing with this series of articles. It brings up debate and pushes the envelope to let individuals explore whether this is possible so I hope despite all the critique he continues this series. One key thing that Jonathon talks about a lot is trying to keep within that limit. Like dieting, many schemes break down because they want you to rely too much on will power. When you are weak too often you don’t keep to it. Instead, make it a point to create keystone habits and eliminate bad habits through lifestyle change. Once you built in good habits, you will realize the money saving comes eventually. The thought of keeping within a limit and not knowing what will hit you in a single day is daunting. You will hate facing the day that way. This is the reason why no one does budgeting. People hate it when you take things away from them! And you do that to yourself every single day to evaluate that! Quarterly or Annual planning of a feasible monthly spending envelope will be good enough. My friend told me how he got inspired in optimizing his money because his lecturer who is well off, is keeping a paper notebook recording down his expense. If a well off millionaire can do that after having so much money, why is it so hard for normal folks to do that?